Betfred are without doubt one of the biggest and most recognisable names in the betting industry. The company have a long history within sports betting after being founded in 1967 by that of Fred Done. One of the aspects that they have found a lot of success is through that of football betting. They’ve been pioneers in the form of trying new markets and offering new, exciting services to football punters around the world. Whilst many have caught up to them these days, they are still regarded as being one of driving forces behind the plethora of betting markets that you see today. 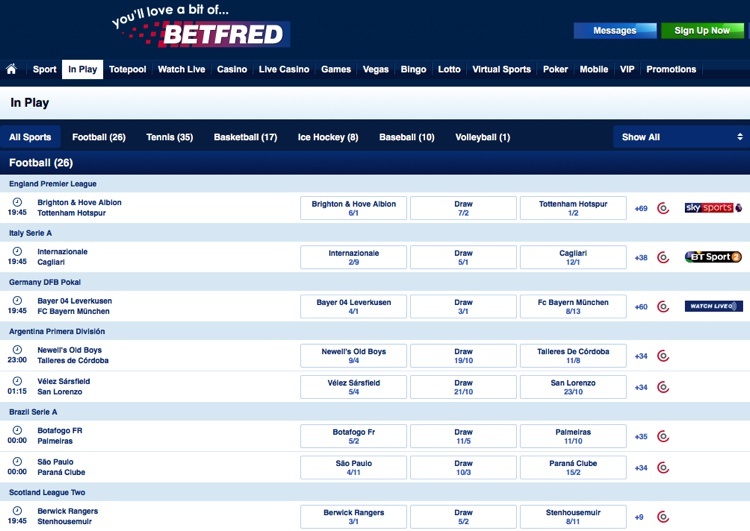 We probably think it’s fair to say that Betfred got left behind somewhat amidst the boom of online betting. There were new brands coming in thick and fast, and also more established brands that were evolving faster than Betfred. What they’ve always been competitive with is their pricing structure. From the research that we’ve been able to carry out for the production of this article we would argue that this is no different and as a sweeping statement, you’ll be hard pushed to find a more competitive pricing structure for betting on football than at Betfred. Like most bookies, their work within the top flight of English football, the Premier League, is one of their strongest areas. As with all reviews, we take a handful of games from each league to see what is working and what isn’t, then compare them against each other. It didn’t take long to find a plethora of games that Betfred were really well priced for. The game below is an upcoming match between that of Brighton and Tottenham Hotspurs, of which you can see that Betfred are best price on – on their own may we add – for both the draw and a Brighton win. Also, it’s worth noting that they aren’t very far away at all for best price on Spurs to win. Whilst the longer odds results (draw and outsider) are often easier to set for bookies as less money goes on these results, often the proof of the pudding is with the favourites, especially the short-priced favourites. The very next match we looked at, Bournemouth v Man United, shows that Betfred are once again best priced, but this time for the short-priced favourite. This is a really good sign for the bookmaker and if you are seeing that this is a common trend, then you know their pricing is going to be very strong throughout. In fact, for all the games that we looked at (around 20 or so in the Premier League) we found them to be super competitive and had with them a number of best prices around. As we moved down the leagues to the likes of the Championship, League 1 and League 2, we found that their stronghold in the prices started to settle somewhat. There were much fewer games that they were best priced for and with it looked a little more ordinary compared to their work within the Premier League matches. But, they were by far from poor in their odds, just not the standout prices that we had seen. Whilst you are likely going to still be taking advantage of a well-priced bookmaker for lower league football, we think that the value really lies within betting on the Premier League in terms of finding the best odds. The market coverage for games wasn’t too bad, but it was lacking compared to others that we had tested. We wrote a review on 888Sport within the site and noted that they offered over 200 markets for a Premier League game. Betfred have, for an upcoming match, just 69. To be honest, whilst it seems a massive gulf and technically it is a massive gulf, the markets that were on offer would suit probably more than 90% of the betting public. The usual suspects were all on offer, with the likes of the outright winner, BTTS, Over/Under goals, player markets, cards, corners, you name it. To summarise, whilst the numbers seem way out, in the real world it’s not all that bad. If you are looking for slightly more niche betting markets though, then you may need to look elsewhere. It’s also worth noting that these numbers do tend to increase as they turn in play. The image below shows the comparison of a game that hasn’t kicked off in the Premier League and a game that is 10 or so minutes in from the Bundesliga. This leads us nicely into talking about how the international games compare. For a start, they have a great range, no question about it. The major leagues are all included such as La Liga, Serie A, Bundesliga, Ligue 1 etc. but on top of all that you get a good mix of games from around the globe as well. There are some really obscure inclusions, such as the lies of the Faroe Islands, Kazakhstan and Ukraine, to name just a couple. In comparison to other bookmakers, there is little to choose between them to be honest. The number of markets will vary from league to league, with some of the further afield games have just a handful to the likes of La Liga being able to rival that of the Premier League for most counts. 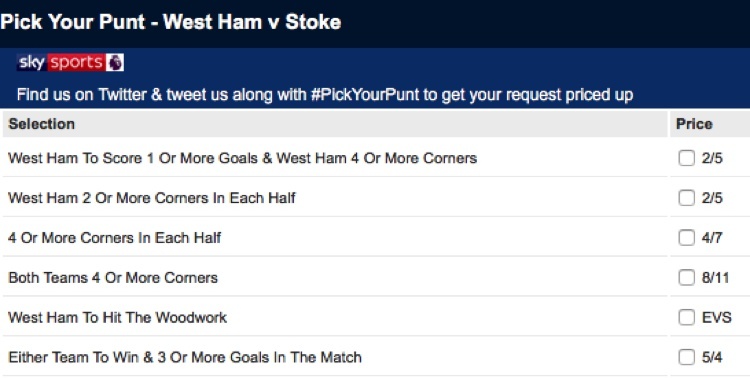 Pick Your Punt is Betfred’s version of a request a bet. It’s a simple process in that you are able to tweet Betfred (@Betfred) with selections that you would like to see in the bet and then use the hashtag #pickyourpunt to get your bet made. What happens is that the bet selections are taken away to the traders within Betfred and from there they come up with a price for your bet. All bets will be live on the bookmaker and you can find them by either searching through the markets for that game or simply by navigating to the #pickyourpunt section on the website. We also liked that they included cross match bets as well. This is where you have a certain outcome for each of a number of matches. The picture below best highlights it. It’s not something you see all that often for these bets as most like to confine them to just within one game, so you have to say fair play to Betfred for offering this. Goals Galore has possibly been one of Betfred’s most successful exports since they made the switch to online. The format made the BTTS bet as popular today as it’s ever been and brought a betting market that got little to no traction, to become one of the most bet on markets within the industry. As you can see, the odds really start becoming highly lucrative with the more selections that you add. The popularity of the bet has seen Betfred adapt it somewhat as well. They’ve included a Goals Galore Bonus list where the odds are, slightly higher for each selection, but the number of games to choose from are lower. They’ve also more recently included a Goals Galore 1sthalf, Goals Galore 2ndHalf and a Goals Galore No draw. The latter is a new concept for the 2017/18 season where you pick a game that will have BTTS, but if it’s a draw then your bet loses, basically requiring your bet to have a winner at full time. Another unique and fairly new market o Betfred is that of the Beat the Clock bet. It works in the same way that the Goals Galore coupon does above, in that you get a list of games to choose from for that day. All you need to do is pick games that see a goal scored in the first 30 minutes of that match. The payouts are also fixed and are actually similar to that of the prices that we’ve mentioned above, although slightly larger as you work down. On the outside it appears as if this coupon can be a bit of a crap shoot, but actually, when you apply some statistical analysis to it from a site like soccerstats.com, it can prove to be rather lucrative. Another adaptation of this bet is the 20 minute market, which works the same, just less time. Betfred is another bookmaker that has jumped on the ever-increasing bandwagon of cash out betting. The feature is available with a number of sports, but it’s most commonly used with football. For those that aren’t aware of cash out betting, it’s basically a process that allows you to settle bets early. It means you can guarantee your return from your bet before that market has settled, either guaranteeing a profit or reducing your losses. It is worth noting that cash out is not going to be available on all football betting markets. But, Betfred do make it super clear which markets and games that they will be including with the feature, which means you don’t have to trawl through pages of terms and conditions to see if your bet will be a cash out bet or not. Well played, Betfred! One thing that we did pick up on with this feature is that it does work a little slower than most. What you will find is that when you click cash out, your bet will actually be held for a couple of seconds usually before being settled, to make sure no movement in the markets occur. At Betfred this seems to take longer than most, often being in excess of 5 seconds, which is actually a decent amount of time. There’s nothing you can do to avoid it, but just be warned prior to clicking that button. In play betting is an important inclusion on the Betfred site. The ability to move to markets that are in play means that you need to move fast and with it, you get greeted with probably the fastest moving page on the site. The layout of this section is much improved, but to be honest, it’s still not the best. The text is uber small on a desktop computer and whilst we think it works best on their mobile app, it’s still far from ideal. We spoke earlier in the market coverage section about the in-play betting section actually offering more markets for games than the pre match section, which does ring true for most games, the Premier League especially. The overview lets you bet on the outright winner market and is fairly easy to navigate between leagues and games that are taking place. You get to see which games are coming up along with which games are currently in play. Saturday afternoons can be a hectic time on site with so much going on, albeit fun to keep an eye on. As you dive into the match, you start to get a really good feel of what Betfred have been improving on over the last couple of years. 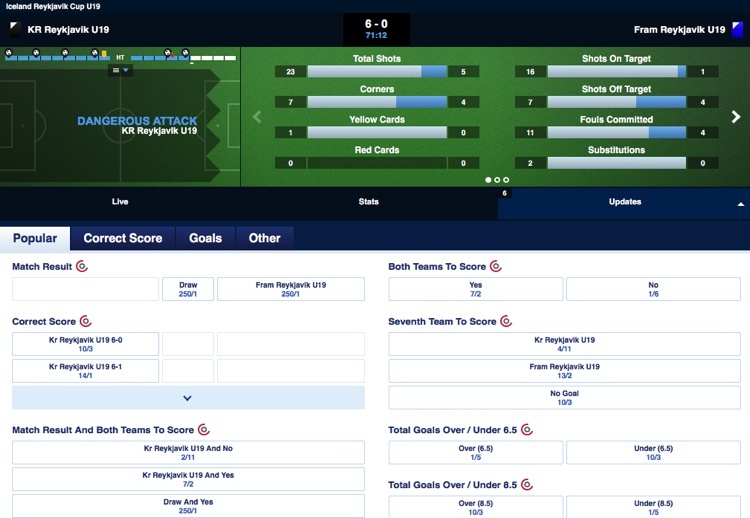 The top sections include your match centre and also the game stats for the match. The match centre is probably the best feature of the site in our opinion and we liked both the graphics and the speed in which it updated. A good test was to simply track a match on here and live on the TV, which showed that the TV was actually delayed a few seconds over the live time at Betfred! Below you get a list of the markets on offer and any bets that you place will pop up in the right-hand toolbar within the betslip. The layout of the markets works really well with its tabs at the top. 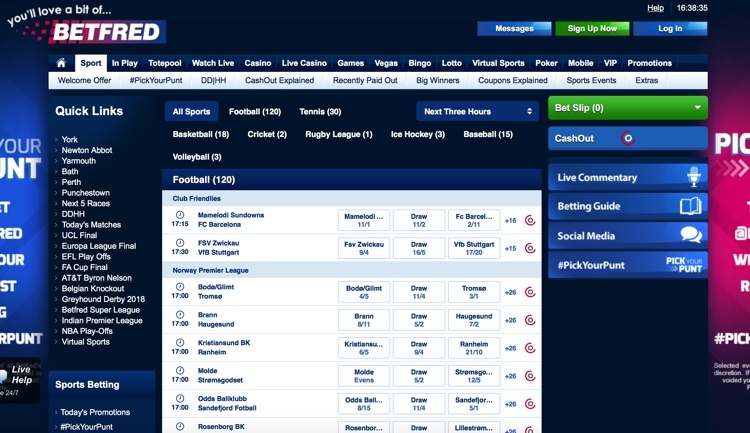 Usually you find sites just list all bets on one page, but this can get highly overwhelming. The tabs allow you to simply flick between the markets and see pretty much all you need in one spot. Whilst in play prices are often hard to track and compare on any real scale, from the little research e were able to conduct into this, we did find that Betfred seemed to offer good value. We weren’t able to check all markets, but the with the main ones we actually found some fairly large discrepancies between their rivals, which was a huge plus for Betfred. As with all bookies, Betfred do have a cap on the most that they will pay out for any single or combination bet that’s placed on site. This will vary for sport to sport, so whilst we are referring to football here, other sports may differ. Betfred allow for a maximum daily payout of £1million, which is one of the highest that we have come across. This includes: For all main European Leagues (English Premiership, Championship, League 1 and League 2, Scottish Premier League, Champions League, La Liga Primera, Serie A, Bundesliga 1 and Le Championnat Premiere), FA Cup, English League Cup and International Matches and Competitions. As you can see the majority of the major leagues both domestically and internationally are under the blanket of £1million, which is as big as you will find. There are few surprises when it comes to banking, with Visa, Mastercard and a range of e-wallets, including the likes of Neteller and Skrill all on hand. PayPal is one of the more recent inclusions on site for banking, with deposits starting from as little as £5. As one of the most well-known brands in the industry, there is much to admire about Betfred. The site offers so much for football bettors and the inclusion of so many unusual bets and great odds make it an obvious choice. But, the design of the site is so dated these days that at times we’ve felt it’s almost been unusable. The slow list navigation down the side and the tiny font makes it very tough to work with. The blue background and white text looks anything but clean and the whole usability of the site is borderline terrible. The fact that this version has only fairly recently been updated does make us wonder what is going on at Betfred? Design is often subjective though and what you can’t get away from is the hard facts, and that is that Betfred offer great value for football punters. The Premier League is a particular highlight for us and if you are looking to bet on this market, then we can’t think of many bookies that better them, let alone can match them.